Shrimp and grits on the other hand is so easy you can practically make it in your sleep. The most difficult part of this recipe was deveining the shrimp, and that was more tedious than anything. You can cut your prep time by buying shelled and deveined frozen raw shrimp. I prefer fresh wild caught shrimp, tedium and all. 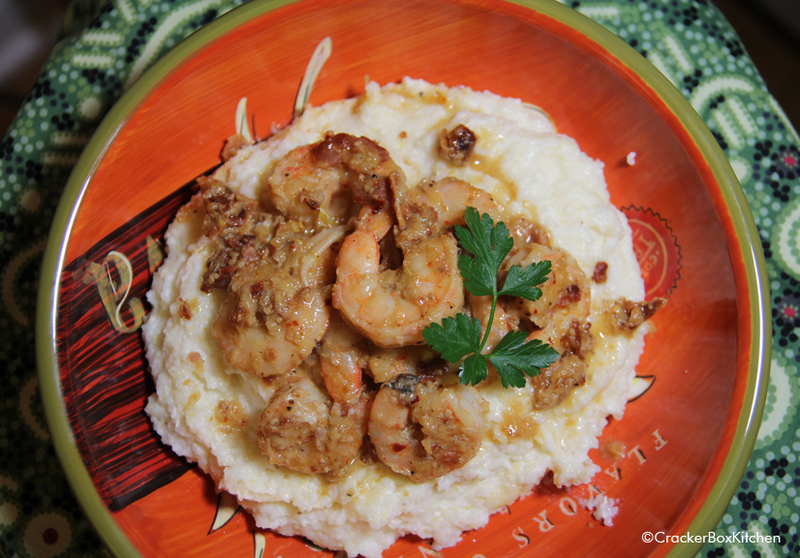 Shrimp and grits can be made with, or with out, cheese. If you don’t mind adding a few calories, you can stir a cup of grated sharp cheddar into your grits after they’re cooked. Either way this dish is delicious, cheese or not. UPDATE: I made this recipe again and added 1/2 cup shredded sharp cheddar and 1/4 cup shredded pecorino romano to the grits. You have one of two options for cooking your bacon: 1) cook it in the same pan that you’ll be cooking the shrimp in, or 2) use the “perfect bacon method”. If you opt for the latter, go ahead and start your bacon first, before you put the grits on. Perfect bacon: Line baking sheet with foil and load with bacon slices. Place pan in oven and set to 400°. DO NOT PRE-HEAT OVEN. Cook for approximately 20 minutes, or until desired crispness. Remove from oven, place on plate, and pat with paper towels to remove excess grease. For this recipe, save your bacon grease. Over medium high, heat 2 cups milk, water, and 1/8 tsp (“pinch”) of salt, until simmering. Whisk in grits, cover, and reduce heat to medium low. Cook for 10 minutes, or until the liquid has been absorbed and the grits are tender. Stir often to prevent grits from sticking to the bottom of the pot. Meanwhile, in a skillet cook bacon on medium-high heat until brown and crisp. Remove from pan, and pat with paper towels to remove excess grease. Once cool, rough chop. Reserve 2 tablespoons grease in pan. In same pan, add onions, garlic, 1 tsp red pepper flakes, and 1/4 tsp fresh ground black pepper. Stirring often, cook until onions are soft. Stir in shrimp, 1 TBS butter, and remaining 1/3 cup milk. Cook shrimp 5-6 minutes, or until shrimp are opaque. Remove from heat and stir in bacon. Spoon grits into shallow bowl and top with shrimp. If you’d like, garnish with more bacon, *wink*, and serve with a side of Tabasco.